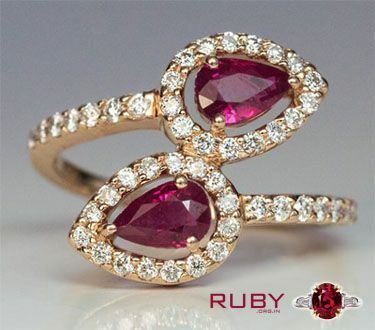 The passionate and stunning ruby gemstone is a thing of beauty. This gem has been the love of many gem enthusiasts over the past so many decades. And why not? After all, the look and feel of the color red comes alive when a ruby beautifies it with such elegance and sophistication! It is the presence of chromium in its structure that gives ruby its natural color. From pink to deep red, the hues are as fascinating as the gem itself. Even though the ruby price is pretty high, the eternal appeal and sheen of ruby make investing in this gem absolutely worthwhile. No wonder why it has earned the status of being one of the most precious gemstones in the world! When it comes to wearing fashion jewelry, ruby takes no back seat. This classic gem can be worn in the form of rings, necklaces, earrings, maang tikas, and bracelets. So, if you are fond of your ruby gemstone jewelry too, but aren’t sure about styling it right, then keep reading these simple yet interesting jewelry styling tips from our experts! Ruby fashion trends is a timeless concept. Wearing ruby jewelry is a sure shot way to give any ensemble a classy edge instantly. Well suited for the different occasion, rubies are great to rev up your style whether you want to delight the onlookers with your chic, casual look or you want to stand out from the rest during a work event or a social evening. 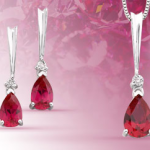 Let’s look at the various ways to wear and style different types of ruby jewelry. 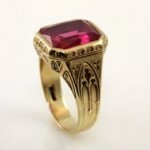 Do you have a beautiful ruby ring in your closet, but aren’t sure how to style it? Well, worry no more. You can easily wear ruby rings as per the occasion you are heading to. A simple platinum ring with a ruby studded in the center can add great charm to your personality during a casual event. While a ring with a bed of rubies, interspersed with little sparkling diamonds, would be a perfect choice for a date night. 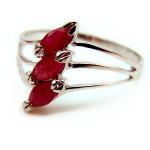 Wearing ruby gemstone ring alone can make you look all the most elegant and beautiful. A pair of ruby earrings can never go wrong in getting you all the attention that you deserve. Wear simple, delicate ruby studs at work, and keep the large ruby earrings for traditional functions. You can even accentuate the panache of your dresses and gowns by complementing them with a pair of ruby and diamond earrings. But while wearing huge ruby earrings, make sure you go light on makeup, especially on the blush as a strong blush can clash with the ruby red color, creating a loud look, that you won’t want. Keep the blush neutral and rock that natural glow with the stunning ruby hue adding on to your rosiness. To create an exotic look, wear a ruby necklace with a dress that isn’t red in color. When you wear this stone with outfits that are of contrasting colors, it will enhance the splendor of the stone even more than what you can imagine. So, go for solid colors like white, black, blue, yellow and gold when picking dresses to adorn with your pretty ruby necklace. A ruby statement necklace can win several hearts without any difficulty. 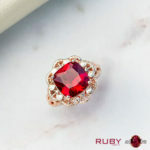 But when it comes to styling it, make sure that you wear it alone so that the beauty of the ruby gem can be highlighted. Do not wear too many jewelry pieces with a statement necklace and avoid looking over the top by keeping it minimal, and keeping it stylish. Create a gorgeous traditional look with a ruby maang tika and let the red color of this wonderful gemstone work wonders on your personality. But, while flaunting a ruby maang tika, go subtle on other accessories, especially on the bindi. Don’t wear a bindi that is too loud in appearance and takes too much of attention away from the ruby stone. Wear a simple yet attractive bindi to highlight the beauty of the ruby maang tika. With the graceful and spectacular aura that red rubies create, they are a great choice for adorning a bracelet. Get a sparkling ruby bracelet and team it up with a maxi dress or traditional Indian dress to celebrate its vibrancy. You can even wear a dainty ruby bracelet with summer dresses or casual wear to look completely chic and ravishing without any fuss. Can Ruby Gemstone Be Worn As Pendant?